to choose our own lifestyle here in America. Well well, once again, I present a whole new idea in cupcake decorations. Lezlie decided to do something different when I asked for hearts on top of cupcake bead icing and I like it! The chocolate cake is extra dark and difficult to photograph as it looks black if I'm not careful with the lighting. Don't these hearts look airbrushed? They remind me of the designs coffee barristas design on top of cappuccino foam. I can imagine these in most any color. Let me know if you'd like a particular combination. See more details & photos HERE. I just received this yummy Chocolate Rosebud Cupcake bead today. It is a play on my other beads by the same artisan you've seen that usually have pink sprinkles. I like that you now have a choice between the two styles but you get your chocolate one way or another! For the moment, I only have one of these. More are on order but I don't expect them until mid to late June. So if this is for you, snag it HERE now. I have another chocolate surprise for you on the next post so I'll see you then! Here are some pink and red cupcake beads, both topped with matching hearts along with a pair of black cherry topped cupcake beads that are on their way to my studio. I challenged the artisan to put something other than the usual sprinkles on top and I like how these turned out. Send me an EMAIL if you want to reserve any or all of them. Other than that, I boldly prepared my mother's lasagna recipe last night. I say boldly because I feared it wouldn't taste like hers. She is no longer here so I couldn't ask questions if I needed to! The recipe is so old that when she says "parmesan cheese" in the recipe, she means the canned kind we used in the 60's!!! Not the lovely, fluffly parm we get these days from "microplaning" it from a pricey block of Reggiano. I had to call my dad to verify if on that one ingredient Mom splurged beyond our very tight family budget. ME: "Hi Dad. I know Mom only fixed lasagna for special occasions like all of us kids' wedding rehearsals...now, I know she used the 'canned' parmesan the year round but did she still do it on the cheap for this special lasagna?". BABY BROTHER: "Sis, I can't believe you think she'd do it any way OTHER than cheap!" Hee hee...I had a moment whilst the dish was baking away where I feared that if it tasted different then the memories surrounding it might be affected in some mysterious way. Since she cooked it so rarely, would those fun and loud rehearsal dinner memories shrink in intensity? More importantly, if it didn't taste the same, would I lose a part of my Mom in some way because I couldn't recreate this dish? Goofy, I know, but these were the weird thoughts bouncing off the walls of my crazy brain. The good news is that it tastes JUST like Mom's. Whew...and with nearly every bite I feel I'm connecting with her and with the wonderful memories like.... the luscious anticipation at every rehearsal dinner, knowing how that fabulous lasagna was going to taste the same EVERY time along with the fresh loaves of challah (holl-uh) bread that always accompanied it (haven't attempted THAT recipe yet) and.....feeling the joy of looking down that loooooong table to "drink" in the 25-30 family members that were talking and laughing....and most likely feeling the very same joy I did. Remember when I told you I had dreamed of beads a couple of nights in a row in THIS post? Well, these are the beads that started it all. I dreamt one night of this color combination...aqua, white & black. The NEXT DAY I happened to visit Jena Fulcher's site and these beads had just been posted that day! I just couldn't believe and knew that I had to buy them. What's funny is that when I sat down to play with them, adding black beads made these look to heavy....cream beads took away the spotlight and this green is so unique I had no other green to match them or enhance them properly. So, completely befuddled, I even tried Kerry Bogert's method of blending colors in THIS post and got a little lost. So for now, I've set these beads aside and will try Kerry's method again in the future. Meanwhile I am just amazed by the simplicity of these beads and the fact that just adding those black strips completely changed them and turned them into little life preserver beads. Hmmmm, now there is something to build on: a nautical theme. Man, I had the best berries today...strawberries, and super plump raspberries and blackberries that were huge. I also got more watermelon beads, but this time, instead of cupcakes, they are in a bicone shape and just marvelous. Nikki from Bastille Bleu is the glass artisan and aren't they sweet! 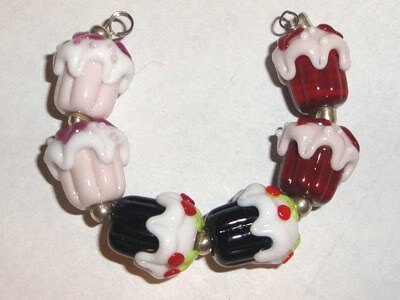 My first attempt at working with them is to see how they mix with my watermelon cupcake beads from Candice Mathewson in a bracelet...can you say "slurp?" I'll let you know how they turn out. And now for the finale of "Lost"...I'm not giving anything away here because I know some of you still need to watch it. I have to say that it satisfied me enough to make me smile amidst all the sweet tears it also produced. I am raving mad, though, that two important lines were completely incomprehensible! Kate and Juliet both made a one line statement that I couldn't understand no matter how many times I replayed it. Kate said something to Desmond and Juliet to Sawyer and I am completely in the dark on both...can anyone clarify? Kate's was super important, I know that for certain based on Desmond's question. For the first time ever, Jack cried and Jack smiled and I've been waiting to see both for a long time...ahhhhh, vulnerability in Jack...gee, what a concept. And wasn't it lovely to see everyone CLEAN for a good portion of the show??? heehee. My mom loved giraffes. I saw an elegance in my mom that she probably didn't see. I think that is why this particular animal was attractive to her as it is elegance personified, except perhaps during its awkward water drinking position. Otherwise, its movements are fluid and beautiful, and appear to be in slow motion. I came across this bead set and knew I just had to have it so that I could wear it in jewelry that would remind me of mom. The color orange is definitely NOT a color that looks good on me but Mom was a "winter" as far as color groups go, which means her skin tone and hair color could accept ANY color. She looked good in ANY color and the one that fascinated me the most....because very few people could get away with wearing it, like Mom.............was orange. So now you know this set was meant for me. The one point Mom always looked for in art pieces of giraffes was that if it didn't have eyelashes it wasn't a true depiction as a giraffe's eyelashes are quite spectacular and make for a very important personality point for this animal...and you'll notice there are no eyelashes on the little murrini giraffe in the focal bead. But, considering that bit of murrini is smaller than the tip of your pinky finger and has THAT much detail, I think Mom would have forgiven the artist, Zachary Jorgensen, in this one case. I blended the matching beads with chunky Bali silver and black lampwork beads on a Greek leather cord, and finished it with a fabulous heart clasp for another show of love for Mom. It's heavy enough so that I always feel it when wearing it, reminding me the entire time that Mom is with me in a way and I love the fact that the focal bead is big enough to get a nice firm hold and rub it when I want to enjoy memories of Mom. My wonderful, tough, stoic, sassy, graceful Mom. I miss you, Mom. I love you, Mom, and I hold you just a little nearer to me when I wear this necklace. I've been so obsessed with cupcakes lately it feels good to talk about something else! So, in that vein, what would you like to know about me? 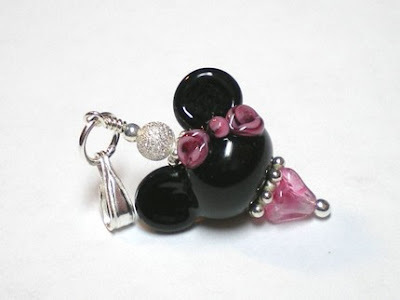 I listed another glamourous Minnie pendant. 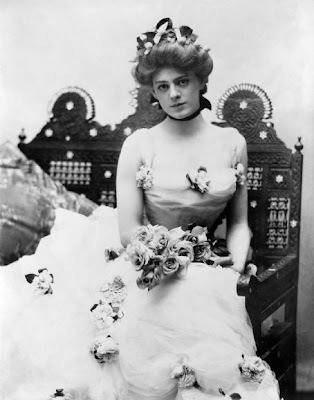 Did you know that the phrase "Glamour Girl" came to be because of Ethel Barrymore, Drew Barrymore's great aunt? I just watched "The Barrymore's" recently and learned that she was the first actor ever that stirred the media to track her every move which we now refer to as "paparazzi" (in Italian, that translates to mosquito...which we then understand to mean "pest"). I only knew of her as an old woman in film, but her heart was not there at ALL...it was the theatre, the stage that enthralled her. And look how beautiful she was. I was also completely unaware that her father, mother AND grandmother had all performed on the stage as well. I'd never even heard of her father, Maurice, before...and up until my thirties, I was an acting buff and proud of the trivia I knew of this institution! Surprise, surprise. Happy Monday, Everyone. 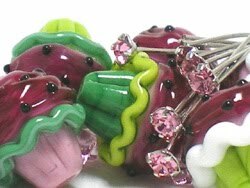 I found a new supplier of cupcakes in lampwork glass. This artisan creates a fuller cupcake portion so you have nearly double the glass found in the smaller cupcakes in my shop. So if you want to make a big statement, this is the size for you! First off, a crisp, clean black & white bead with fabulous ruffled edges that look like ribbon. 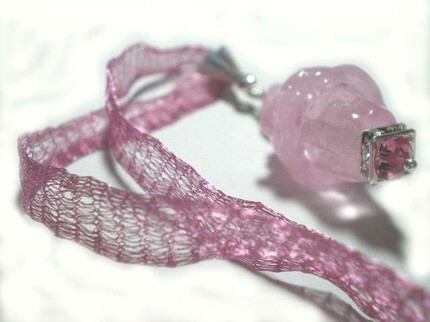 Sitting on a little Czech glass bead, flanked by clear Swarovski crystals and suspended from a marvelous Bali sterling heart bail, this cupcake is really pretty. You can read more details and see more photos HERE. And now for the wild and wonderful. (I'm really putting myself "out there" by showing you this piece, so please be kind!) I took another black & white cupcake and pulled out some spectacular large beads I have in the same colors. I was just in a mood to see what I could do with these larger cupcakes beyond the usual fare, so I grabbed some wire and just played. I normally don't play with beads. I typically work when I have an idea, but this time I made myself sit down and just handle the beads and dig through the box until something inspired me. And oh, did these beads inspire me! I really like how this little cupcake tower turned out. It's big and bold and some will say crazy, I'm sure, but I like it and that's what counts. Lesson: I learned that I could have used a thicker gauge of wire to keep the tower in better alignment, but I think if I wrap some coiled wire over the existing wire I can overcome that situation. I have had a crazy 2 weeks in the bead world. A couple of weeks ago I had a dream of a very specific color combination...not the bead shapes themselves, but just how pretty the color combo would be. The NEXT day one of my favorite bead artists just happened to list a set in those very colors! Well, you know I had to order them, right? Then that night I dreamt about watermelon colors. A favorite artist of mine, Cathy, makes pretty beads in that theme so the next morning I contacted her about the possibility of putting them into a cupcake shape. I left her thinking about it. Later that evening I was going through Facebook to find bead artists to add as friends and I sent a request to Cathy's sister, also a glass artist, of whom I was aware but had not dealt with before. Well, when "Sis" contacted me to say that she would add me, she told me that she had spoken to Cathy earlier and Cathy mentioned the watermelon cupcake idea. Sis just about flipped out when she told Cathy that that very day she had been attempting to put a watermelon theme into a cupcake shaped bead. Wowie zowie! Sis sent me photos and we talked about other color combinations and boom, zang, whiz, here we are with spectacular jewelry featuring these very unique beads. 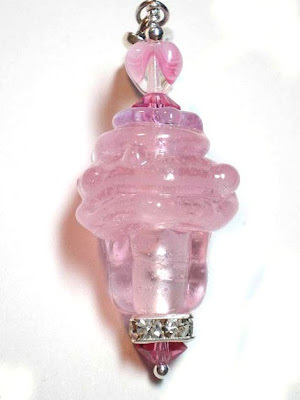 I love the wet look in the icing...if I am correct, that is Rubino glass over pink to give it that effect. I have other combinations of these colors as well and am playing with a bracelet idea. If that doesn't pan out, I will release more earring pairs for you. You can see more details and photos HERE. And remember, if you can dream it, it might just become reality! Yowza! Can you believe it? Leopard cupcakes in pink! I just had to have these when I saw them. I have a set like this in animal print colors in my SHOP but in pink???? Okay, I might have got you scratching your heads yesterday when I mentioned fruity cupcakes. Or maybe you expected ones you've seen before with a tiny set of strawberries or cluster of grapes where you usually have sprinkles. But NO, my friend, not even close! You will marvel at the story surrounding these sweet bits of glassy fruit...which I will tell when I return near the end of the week with the finished product. Ahh, yes, you can count on story time then. Cupcake overload...that's a GOOD thing, right? In this case it is for sure. I just received a hefty batch of cupcake beads from a glass artist I recently discovered. I was particularly drawn to her stringer work you see in most of the ruffles. It adds a wonderful dimension I don't often see. Here are a couple of close-ups for you. I got a lot more than you see here and these are bigguns, ladies & gents. You are looking at about double the glass you've seen in my past cupcake jewelry so these will all become pendants for necklaces. Let me know if you want any of these shown here and I'll create a listing for you in my Etsy SHOP. Hey, all you contest winners, I mailed your goodie treats today so keep an eye out! Yay, a non cupcake item! I'm sure you are just as happy to see something fresh and new. I was awed by these beads and just had to have them. I've seen beads with dots, but these raised dots add a marvelous depth, especially the transparent red ones. These made a spectacular bracelet. Can you imagine blowing other casino goers minds with this piece? Or wearing it with a red, white or little black dress at a Vegas show? What I like most is the dark red glass. It's not a primary red...it's deep with almost a brownish tone that keeps it deep rather than bright. A nice chunky piece that is a blast to wear. More details and photos are HERE. and with FOUR rosebuds on top instead of 2.....weeeee! 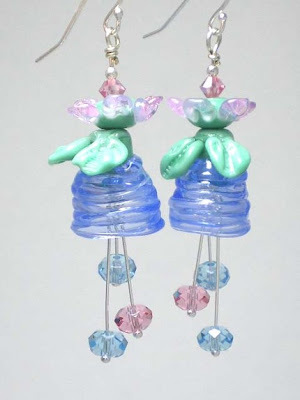 I SCORED contact with a U.S. glass artisan who made some very special cupcake beads for me. I'm so excited to share them with you! They should be here in about a week. This artisan uses design details that I've not had in my shop before. I found her just at the right time where she had a weekend to handcraft some fresh beads for me. I selected the ones I wanted today and man was THAT ever fun! Are you a Cupcake Contest Goody winner? Tylerpants, the 3rd place winner!